The best discount Timing Chain OEM Parts. Our inventory is always being updated, searh for Timing Chain parts for the following makes. 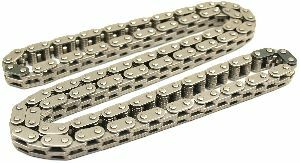 A Timing Chain rotates and synchronizes inside of your engine, much like a Timing Belt outside of your engine. The Timing Chain needs the oil that is inside of your engine as lubrication to prevent it from becoming worn out. When should you replace your Timing Chain? 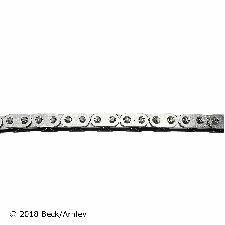 A Timing Chain only needs to be replaced if there is an issue with it. Problems can occur if oil levels are low, which will reduce lubrication for your engine and Timing Chain, so more friction and damage may occur. A rattling noise is coming from your engine. 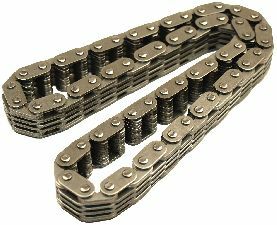 Sreet Performance 3/8" Pitch Double Roller Replacement True Roller Chain. Seamless 0.250" Roller Diameter. Heat Treated and Processed Links to Maximize Breaking Strength while Remaining Ductile for Toughness. Prestressed to Increase Fatigue Life. USA Made. 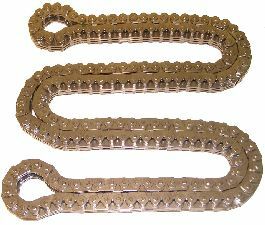 Chain Row Quantity: 1 Link Quantity: 122 Overall Length: 22 5/8"
Pre-Stressed And Heat-Treated For Increased Durability. Precision Cut Links With Smooth Finish. Precision Pitch Control For Proper Chain To Sprocket Tooth Fit. 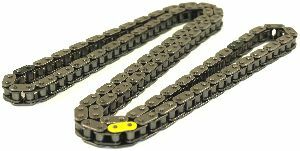 Chain Row Quantity: 1 Link Quantity: 148 Overall Length: 23 1/4"
Pre-Stressed And Heat-Treated For Increased Durability. Precision Cut Plates And Rollers With Smooth Finish. Precision Pitch Control For Proper Chain To Sprocket Tooth Fit. 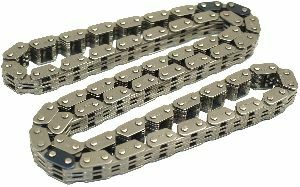 Chain Row Quantity: 1 Link Quantity: 106 Overall Length: 16 3/4"
Chain Row Quantity: 1 Link Quantity: 130 Overall Length: 20 1/4"
Chain Row Quantity: 1 Link Quantity: 58 Overall Length: 11"
Chain Row Quantity: 1 Link Quantity: 130 Overall Length: 24 3/8"